Presently, the Insurance Research Council estimates that approximately one in six American drivers is uninsured. That number increases dramatically when underinsured drivers are included as well. If either an underinsured or uninsured driver were to hit you, without the proper coverage, you could end up paying for some or all of your injuries and damages. Uninsured motorist coverage is designed to insulate you from that situation by paying for whatever the at-fault driver's policy did not. When a driver is at fault for an accident you are involved in and does not carry auto insurance, uninsured motorist coverage will pay for any medical expenses you incur, your pain and suffering, and depending on the laws of your state, the damage to your property. Underinsured driver coverage works in much the same way-if the at-fault driver's insurance policy has coverage limits that fail to pay for all of the damage done, underinsured motorist protection will pick up the rest of the tab. Carriers describe uninsured driver protection using two numbers: the first is the maximum amount the insurer will pay for injuries sustained by one person in an accident with an uninsured driver, and the second is the maximum amount the carrier will pay per accident. For instance, you might choose uninsured motorist protection of $15,000/$30,000. When Is Uninsured Driver Protection Necessary? While only a handful of states legally require uninsured motorist coverage, it is still a smart choice for almost all drivers. Of course, if you live in a state requiring the coverage, such as Connecticut, you will have to purchase the appropriate amount of protection in order to drive legally. 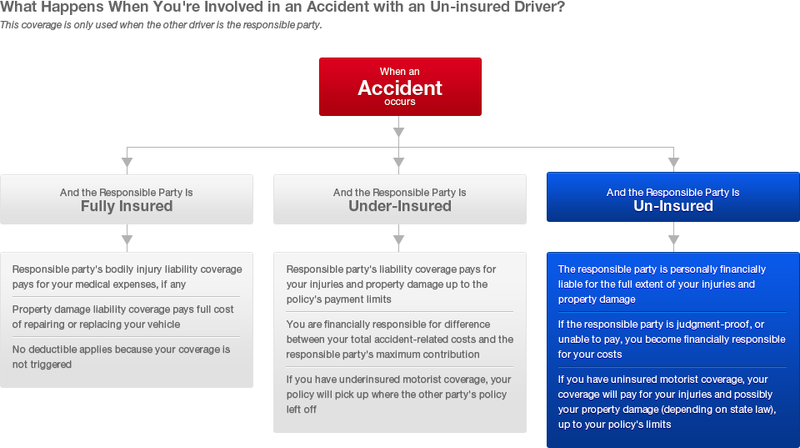 For other motorists, uninsured driver coverage makes sense even if not legally mandated. The coverage will pay for lost wages, medical expenses, pain and suffering, and possibly vehicle repairs (such repairs may be covered by collision depending on your state) if an uninsured/underinsured driver hits you. Uninsured driver protection is especially important for drivers who live in states with a large number of uninsured motorists, such as New Mexico (29 percent), Mississippi (28 percent), and Alabama (26 percent). Most carriers offer uninsured motorist coverage for a very reasonable premium, especially considering the large amount of protection the coverage provides. The modest additional cost is well-worth the coverage you receive in the vast majority of cases. Without uninsured driver coverage, you would be stuck with the bill for your medical expenses caused by a driver legally responsible for the accident but unable to pay for the full extent of the ensuring injuries and damages. That amount could be considerable, which is why uninsured motorist protection is almost always the right choice.